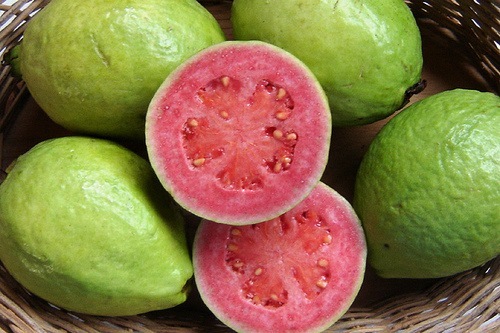 While its exact origin is unknown, Guava is historically found the region of southern Mexico through Central America. This tropical tree and its fruit thrive in both humid and dry climates, with several varieties that are able to be grown in the coastal regions of Southern California. Belonging to the Myrtaceae family, the Guava tree is evergreen, with smooth, red-brown or mottled green bark and stiff, muted green, leathery leaves that have a slightly soft underside and are pleasantly aromatic when crushed. Guava fruit ranges greatly in color, size and flavor, with the preferred varieties being soft when ripe, having an edible skin, and featuring the creamy, juicy flesh and sweet, musky odor for which they are most commonly recognized.